Northwest Iowa Community College follows a nationally accepted philosophy in administering financial aid programs. This means you and your parents have a responsibility to meet as much of the costs of attending college as is reasonably possible. You may meet all or some of the costs through your parents’ contribution and through your own resources, including savings and earnings from summer and school year employment. Financial aid is awarded to supplement these financial resources. The Financial Aid Office staff administers aid programs and counsels students in the financial aid process. Contact the Financial Aid Office for answers to any questions regarding financial aid. Have a high school diploma or a high school equivalency diploma (GED/HSED). Demonstrate financial need, which is the difference between the cost of attending college and the amount you and your family can provide. Scholarships, grants, loans, and part-time employment are available in various combinations to meet financial need. Complete and submit the Free Application for Federal Student Aid (FAFSA) by April 1. If applying for aid after the April 1 deadline, you will be considered for assistance according to the availability of funds. Because financial aid is awarded for one academic year at a time, it is necessary to submit a new financial aid application (FAFSA) for each year of enrollment. Students adding or dropping courses after the first week of the regular semester start date should discuss with the Financial Aid Office what effect the course change may (or may not) have on their financial aid. Financial aid will not increase if courses are added after the first two weeks of the semester. Check with your Advisor and the Financial Aid Office to determine the impact on your bill, your enrollment level, and your financial aid if you are adding or dropping courses. Complete and file a Free Application for Federal Student Aid (FAFSA) by April 1 for priority aid consideration. The recommended way to apply is online at fafsa.ed.gov. If you prefer to complete a paper FAFSA, call 800-4-FED-AID to request a paper application. Be sure to list Northwest Iowa Community College in the school section of the FAFSA. NCC’s School Code is 004600. When entering income information on the FAFSA, you may want to utilize the IRS Data Retrieval option to transfer student/parent income data directly from the IRS and into the FAFSA. Complete the application procedure for admission to NCC. You will not receive notification of financial aid awards until you are officially accepted by the Enrollment Office. Forward all requested forms and documentation to the Financial Aid Office. If you are selected for verification, you will need to complete a verification worksheet and you may need to submit IRS Tax Transcripts for student and parent. All requested documents must be received by the student’s last day of enrollment or the end of the term, whichever is earlier. Students who do not submit all requested verification documents cannot receive Title IV funds, but may receive institutional funds. Northwest Iowa Community College will not make an interim disbursement of Title IV aid. Verification may require a correction to the FAFSA and this may result in a change of the student’s eligibility for funding. Report acceptance of all outside scholarships or loans to the Financial Aid Office. Aid received from other sources may result in a revision to your financial aid award. If you are awarded financial aid, you will receive an award letter, based on full-time enrollment, showing the financial aid you have been offered and the amount of each award. The awarding of aid depends upon the availability of funds, accuracy and timeliness of the application, and eligibility for specific aid programs. If you have been awarded aid in addition to that awarded by the Financial Aid Office, you must notify the office in writing, so that your awards can be reviewed for possible adjustment. Grant and loan money is disbursed on a semester basis and applied directly to registration costs after your attendance has been reported. If aid is less than the amount due, you must pay the amount not covered by financial aid. The remaining amount is due the first day of your term. If aid for a semester exceeds total costs, the remaining amount will be reimbursed to you. Grants for late start classes will not be disbursed until the class has begun and attendance has been reported. Students must be attending and making academic progress in order to receive financial aid funds. Due to federal regulations, the first loan disbursement must be delayed 30 days from the first day of class for first-year, first-time student loan borrowers. Loan funds will be disbursed only after classes have begun and attendance has been reported for at least 6 credit hours (this applies to all terms—fall, spring and summer). Disbursement of financial aid will not occur until NCC receives official documentation that confirms the students’ high school graduate status. Disbursement of financial aid funds may be delayed or denied for students who exhibit abuse, fraudulent activity, give false or misleading information, or misuse federal, state, or institutional funds. If your enrollment status changes or you officially withdraw or unofficially withdraw from the College, the Financial Aid Office may be required to reduce the amount of financial aid, or reclaim part or all of the refund. An unofficial withdrawal occurs when a student stops attending and/or fails to follow the withdrawal process. If you receive federal financial aid and fail to complete your education, you may have your financial aid adjusted based on the date of your official or unofficial withdrawal. This adjustment of aid may cause you to owe money to the U.S. Government and/or NCC. If NCC is required to return Title IV funds, the amount returned will be billed to you. Failure to repay the U.S. Department of Education or NCC will result in your account being turned over to collections. Anyone in a repayment situation will remain ineligible for federal aid until the repayment is resolved. A withdrawal will also prevent you from meeting the Financial Aid Satisfactory Academic Progress Standards and impact your future financial aid eligibility. Financial aid CANNOT be used to pay for EMT, AUDIT, CLEP, Credit by Examination, Credit for Experiential Learning, or Credit for Military Experience courses. The tuition and fees for EMT classes will not appear on your tuition statement and will be billed separately by the Continuing Education Department. It will be your responsibility to pay the Continuing Education Department for these classes. When a students’ account has a credit balance (due to an overpayment or due to financial aid funds exceeding total costs), the excess funds will be given back to the student/ parent borrower. Balances are processed weekly beginning 30 days after the semester begins. The funds that create the excess balance must be received by the Business Office by NOON on Wednesday for the balance to be issued to the student/parent that same week. Students will receive an email from the Business Office when a balance check has been issued, or when the funds are delivered via direct deposit. Students who are interested in the direct deposit option may contact the Business Office for details on how to sign up. Federal regulations require Northwest Iowa Community College to establish satisfactory academic progress standards for student financial aid recipients. These standards ensure that only those recipients demonstrating satisfactory progress toward the completion of their educational programs continue to receive financial aid. All student records will be reviewed at the end of each payment period (semester/term). A student’s entire NCC record will be reviewed for satisfactory academic progress, including terms for which the student did not receive financial aid. The Financial Aid Satisfactory Academic Progress Policy is different than the Academic Progress Standards, and different from the required academic standards that may be set by a specific program. There are separate procedures when academically placed on probation or suspension. Financial aid eligibility may be suspended; however, Financial Aid Suspension does not necessarily prohibit enrollment in coursework so students need to please check with their Advisor or the Registrar to discuss. Any grade forgiveness granted from the Academic Restart Program/Grade Forgiveness does not apply to the Financial Aid Satisfactory Academic Progress standards. When calculating a student’s satisfactory academic progress for financial aid, all grades earned from all previous enrollment periods will be considered. Whether a student is considered to be making satisfactory academic progress depends on successful completion of courses (credit hours earned), cumulative grade point average (GPA), and maximum time limits to complete his or her course of study. Students must meet all of these requirements to maintain satisfactory academic progress for financial aid. To be eligible for financial aid at NCC, students must maintain a cumulative grade point average (GPA) of 2.0. If a student repeats a course, the last grade issued will be used in the calculation of the GPA. Grades received in developmental courses are not used in the calculation of the GPA. Courses for which the student has been granted grade forgiveness from the Academic Restart Program/Grade Forgiveness are included in the calculation of the cumulative GPA. Each semester, a student’s academic progress will be measured by comparing the number of attempted credit hours with the credit hours earned. On a cumulative basis, a student must earn 67% of all credits ever attempted to maintain satisfactory academic progress. Withdrawals, incompletes, and failures are considered attempted but not earned credits. Credits for repeated courses will be counted as earned only once. For a repeated course, only the last grade issued will be used in the calculation of the cumulative GPA. Courses for which the student has been granted grade forgiveness from the Academic Restart Program/Grade Forgiveness are included in the calculation of both attempted and earned hours. Audited courses are not considered credits attempted or earned. Developmental courses are included in the calculation of both attempted and earned credits. Transfer credits, including those received during consortium study, do not count in the calculation of the GPA, but they are included in the calculation of both attempted and earned credits. 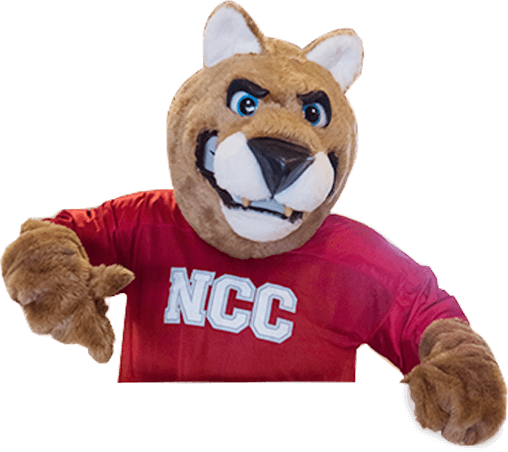 For an enrolled student who changes programs or majors at NCC, both the credits and grades from the previous program or major will be included in the calculation of attempted credits, earned credits, and cumulative GPA. A student will not be eligible to receive financial aid once the student has attempted more than 150 percent of the normal credits required for their degree or diploma program, or once it becomes clear that the student cannot mathematically finish the program within the 150% maximum time frame. For example, 90 credit hours would be the 150% program maximum for a program requiring 60 credit hours for graduation. All attempted hours are counted, including transfer hours, whether or not financial aid was received or the course work was successfully completed. The 150% requirement may be applied to the student’s entire academic career, not just to the student’s current program or major. A student’s satisfactory academic progress is evaluated after each term of the academic year. At that time, a student will either be in good standing, be placed on financial aid warning, or be placed on financial aid suspension for future enrollment periods. The student must meet all three progress requirements (completion rate, cumulative GPA, and be within the maximum time frame) to remain in good standing. Students will be notified in writing by the Financial Aid Office if they are placed on warning status or suspension status for financial aid. A student is eligible to receive financial aid for one payment period (semester/term) while on a financial aid warning status. The first term a student fails to maintain the academic and/or completion requirements listed above they will be placed on Financial Aid Warning at NCC. The student will remain on Financial Aid Warning until the end of the next term. At the end of the next term, the student’s progress will be reviewed. The warning semester is meant to inform the student of potential academic problems and provide time for corrective action. If a student does not meet the satisfactory academic progress standards after the warning period, suspension status or academic plan status (due to a successful appeal) would be imposed. EXCEPTION: A student who fails to earn any credit hours in a term will be placed on suspension immediately (skipping the warning status). A student who is placed on suspension will not be eligible to receive aid and must pay tuition and fees in future terms. Suspension status will prevent the student from receiving financial aid, including but not limited to, any Title IV, state, or institutional financial assistance. At any time a student exhibits abuse of receipt of financial aid, fraudulent activity, or falsification of information or signatures. Suspension status will remain in effect for future enrollment periods until such time as the student meets all satisfactory academic progress standards. Neither paying for one’s classes nor sitting out any length of time affects a student’s Financial Aid Satisfactory Academic Progress standing so neither is sufficient to re-establish financial aid eligibility. It is the responsibility of the student to notify the Financial Aid Office that their course work meets the minimum standards and to request that their financial aid be reviewed for reinstatement. Transfer students who apply for financial aid may also be evaluated for satisfactory progress. If a student received financial aid at another institution (according to the National Student Loan Data System), the Financial Aid Office may request transcripts from each college the student attended in order to complete the evaluation of academic progress. Students may also be required to complete an Academic Plan prior to receiving financial aid funds and continued financial aid eligibility will be dependent upon whether the student follows the requirements laid out in the student’s Academic Plan. Students may appeal their suspension status by submitting a Financial Aid Suspension Appeal Form and an Academic Plan Form to the Financial Aid Office. The Financial Aid Suspension Appeal Form may be picked up at the Financial Aid Office. The student must provide a detailed explanation of the circumstances that prevented them from meeting the Standards of Satisfactory Academic Progress and include documentation verifying the situation. Those students who appeal will also be required, as part of the appeal process, to submit and agree to the terms of an Academic Plan. The Academic Plan will specify the steps the student will have to take to get back in good standing. The plan may have stipulations (i.e. limit the credits enrolled, require time in the Learning Center, define the courses to enroll, etc.) that the student must follow. The Academic Plan Form must be picked up from and completed with the student’s Advisor. Modifications may not be made to an Academic Plan once it has been submitted or approved. Appeals will only be reviewed for the first 30 calendar days of the regular semester start date but should be submitted as soon as possible. Appeals turned in after that time will be reviewed for a future term as specified on the Academic Plan. It is strongly recommended that all appeal forms be submitted as soon possible so that appeal results can be communicated to the student prior to the end of the 100% tuition and fee refund deadline. Students who have their appeal denied after the 100% tuition and fee refund deadline will be responsible for the full semester payment, including any book or other charges incurred. The Financial Aid Academic Review Committee will consider the appeal and notify the student of the decision in writing. Notification will occur no later than fifteen days after the Financial Aid Suspension Appeal Form and Academic Plan are received from the student, after all semester grades are in, or after the FAFSA is on file, whichever is later. A student who is placed on Academic Plan status has failed to make Satisfactory Academic Progress but has had their eligibility for financial aid conditionally reinstated as a result of a successful appeal. The continued eligibility of this Academic Plan status is dependent upon whether or not the student follows the requirements laid out in the student’s Academic Plan. Students whose appeal has been approved will conditionally regain eligibility for financial aid under the Academic Plan Status. Continued eligibility will be dependent upon whether the student follows the Academic Plan. The Academic Plan will be reviewed after each term of enrollment to determine if the student is successfully following the Academic Plan. Students who follow the Academic Plan after each term will maintain their financial aid eligibility until the student regains compliance with the Satisfactory Academic Progress standards, or until the student fails to meet the Academic Plan requirements. Students who do not follow the Academic Plan after each term will be placed on Financial Aid Suspension and will no longer be eligible to receive financial aid. Students who follow the requirements in the Academic Plan but the Academic Plan ends prior to the student regaining compliance with the Satisfactory Academic Progress standards will be placed on Financial Aid Suspension and will no longer be eligible to receive financial aid. Students whose appeal has been denied will remain on Financial Aid Suspension and will not be eligible to receive aid and must pay tuition and fees in future terms. Students who are on suspension and wish to regain financial aid eligibility will be required to bring their course work up to the minimum standards at their own expense. It is the responsibility of the student to notify the Financial Aid Office that their course work meets the minimum standards and to request that their financial aid be reviewed for reinstatement. Students may appeal again if circumstances have changed. Example: student successfully completes credits in semesters/ terms after their appeal was denied. Federal law (Section 485 of the Higher Education Amendments of 1998-P.L. 105–244) specifies how NCC must determine the amount of student financial aid assistance that is earned if you cease to attend. If you receive federal financial assistance and fail to complete your education, your financial aid may be adjusted based on the date of the official or unofficial withdrawal. An unofficial withdrawal occurs when a student stops attending and/or fails to follow the withdrawal process. The amount of financial assistance you have earned is determined on a pro-rated basis using the number of calendar days completed divided by the number of calendar days in the payment period. Once you have completed more than 60 percent of the enrollment period, you earn all your financial assistance. The adjustment of aid may cause you to owe money to the U.S. Government and/or NCC. If NCC is required to return Title IV funds, the amount returned will be billed to the student. If the repayment of funds is not made to NCC within the designated deadline, the amount may be turned over to the U.S. Department of Education for collection or a collection agency, depending upon the funding source. Anyone in a repayment situation will remain ineligible for federal aid until the repayment is resolved. Students will remain ineligible for federal aid until the College receives notice from the Department of Education or collection agency that the student has reestablished his/her eligibility. If you need to withdraw from your classes it is important that you contact your Advisor to complete a “Withdrawal Form.” The “Official Withdrawal Date” is recorded by the Registrar after the “Withdrawal Form” is returned to the Student Services Office, or is the date that the student otherwise provides official notification to NCC of their intent to withdraw. However, if documentation is received indicating the student’s last day of attendance is different than the date the student officially withdrew, the student’s last day of attendance may be recorded as the withdrawal date and used to calculate the refund of tuition and fees. Students who stop attending and/or fail to follow the withdrawal process are considered to have unofficially withdrawn and the student’s last day of attendance may be used to determine the refund calculation. If you drop below half-time, withdraw, or graduate, you are required to complete Direct Loan Exit Counseling. You may complete the online Exit Counseling session by going to studentloans.gov. If your enrollment status drops below half time, your future loan disbursements may be cancelled, you will no longer qualify for an in-school deferment of your loan payments, and you will either begin your grace period or your loans may enter into repayment. The Federal Pell Grant Program provides federal aid to eligible students. The maximum grant for the 2018–2019 award year is $6,095. To apply for a Federal Pell Grant, complete and file a Free Application for Federal Student Aid (FAFSA). The Federal Supplemental Educational Opportunity Grant program provides up to $200 per academic year to students who receive the Federal Pell Grant and have exceptional financial need. To apply for a Federal Supplemental Educational Opportunity Grant, complete and file a Free Application for Federal Student Aid (FAFSA) by April 1. The Iowa Vocational-Technical Tuition Grant program provides up to $900 per academic year for up to two years of education, to Iowa residents enrolled in a career or technical program. To apply for an Iowa Vocational-Technical Tuition Grant, complete and submit a Free Application for Federal Student Aid (FAFSA) prior to July 1. The Kibbie Grant, also called the Iowa Skilled Workforce Shortage Tuition Grant, provides assistance to Iowa residents enrolled in specific career or technical programs. To apply, students must complete the Free Application for Federal Student Aid (FAFSA) by July 1. Priority is given to students who participated in certain federal TRIO Programs, graduated from alternative high schools or alternative high school programs, or participated in a Federal GEAR UP Grant program in Iowa. To apply, students must file a Free Application for Federal Student Aid (FAFSA). Students must also complete the Iowa Financial Aid Application, which is available at IowaCollegeAid.gov or by calling 877-272-4456. First priority will be given to students whose applications are received on or before March 1. This program provides grants to students who age out of foster care and students who are adopted after age 16. To apply, applicants must complete a FAFSA and complete the Iowa Financial Aid Application which is available at IowaCollegeAid.gov or by calling 877-272-4456. This program provides a scholarship to students who are part of the GEAR UP Iowa state-wide cohort. To apply, students must file a Free Application for Federal Student Aid (FAFSA). Students who are not Iowa residents must also complete the GEAR UP Iowa Scholarship Application found at IowaCollegeAid.gov. The Federal Work-Study program provides employment opportunities for students who demonstrate financial need. Federal Work-Study provides part-time employment for students at a rate of $8.70 per hour. Community service work experience may be available. To apply, students must complete and submit a Free Application for Federal Student Aid (FAFSA). Eligibility does not guarantee a work-study position. Work-study funds do not apply directly to your bill. You will receive a paycheck for the hours worked in the previous month. If awarded Federal Work-Study, it is the student’s responsibility to apply, arrange for interviews, be offered and accept any work-study opportunities. Once hired, appropriate documents must be completed such as I-9 forms, W-4’s, etc. or during a deferment period. Unsubsidized Loans do not require the student to demonstrate financial need and the student is responsible for paying the interest during all periods. If the student does not pay the interest, the interest will accrue (accumulate) and be capitalized (the interest will be added to the principal amount of the loan). The maximum yearly loan limit for a dependent student is $5,500 for the first-year and $6,500 for the second-year. Federal regulations require all first-time borrowers to complete Entrance Counseling and a Loan Agreement (Master Promissory Note—MPN) prior to receiving the first disbursement of their loan funds. Students will also be required to complete a mandatory Exit Counseling session when departing from NCC. Effective July 1, 2013, Federal law restricts the benefits of the Direct Loan subsidy to a limit of no more than 150% of a student’s program length (measured in academic years) for new borrowers. (A new borrower is an individual who has no outstanding balance on a Direct Loan or on a FFEL Program loan on July 1, 2013, or on the date the borrower obtains a Direct Loan after July 1, 2013.) Once that limit has been exceeded, a student may borrow only unsubsidized loans and will begin to incur interest charges on outstanding subsidized loans. For example, a student enrolled in a two-year program will have three years’ worth of subsidized loan eligibility (150% of 2 years=3). Because the maximum eligibility period is based on the length of the student’s current program of study, the maximum eligibility period can change if the student changes to a program that has a different length. If a student receives Direct Subsidized Loans for one program and then changes to another program, the Direct Subsidized Loans received for the earlier program will generally count toward the student’s new maximum eligibility period. The U.S. Department of Education will undertake the tracking responsibilities to determine when the subsidy limit has been reached, inform schools of a borrower’s subsidy usage, and notify borrowers when the limit has been exceeded. The borrower becomes responsible for accruing interest during all periods as of the date the borrower exceeds the 150% limit. The Federal PLUS Loan Program is designed for the parents of dependent students in order to assist students with the costs of a college education. The loan amount is limited to the cost of attendance minus other financial aid. To apply for a Federal PLUS Loan, complete and submit a Free Application for Federal Student Aid (FAFSA). A parent must also complete and submit a separate Federal PLUS Application, Loan Agreement (Master Promissory Note—MPN) and a Loan Authorization Form (LAF) found on NCC’s website. Federal regulations require NCC to provide prospective students, current students and other stakeholders with “Consumer Information.” This information can be found here.